Among offshore drilling stocks, I have been skeptical about Atwood Oceanics Inc. (ATW) as an investment because of the company's balance sheet health, declining backlog and financing concerns for new rig delivery. As there are some early signs of recovery in the broad energy industry, there are several factors that make the company interesting at current levels. Warning! GuruFocus has detected 6 Warning Signs with ATW. Click here to check it out. For Atwood, one of the key concerns was delivery of new rigs in 2017. The company already has idle rigs and it would have been challenging to win new contracts for rig delivery in current market conditions. At the same time, new rig delivery would have potentially implied an increase in net debt without any increase or desired increase in cash flow. The company, however, has been successful in delaying the delivery of Atwood Admiral until September 2019 and Atwood Archer until June 2020. Therefore, Atwood has not only avoided leveraging at this point in time but also delayed rig delivery to a date where the market could be well into robust recovery. This is a key positive that will help the stock remain at higher levels as credit metrics remain stable. As of Dec. 31, 2016, Atwood Oceanics had total cash of $155 million along with an undrawn revolving credit facility of $545 million. This equals a total liquidity buffer of $700 million. With the delay in delivery of new rigs and the company expecting $240 million in after-tax cash flow for fiscal 2017, the total liquidity in the next 12 months is likely to remain healthy. This is illustrated in the chart below. The key point here is there are early signs of industry recovery and it is likely that offshore market sentiments will be significantly better in fiscal 2018 if oil continues to move higher. Therefore, Atwood Oceanics will move into 2018 with a good liquidity buffer. I also expect the company's liquidity profile to improve beyond 2017. Another big positive for Atwood is that it has been successful in deleveraging at a time when many offshore drillers have struggled to do so. 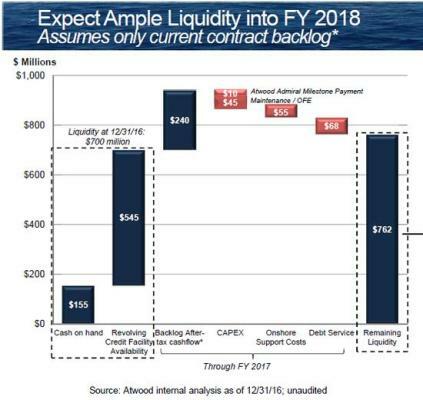 Just to put things into perspective, Atwood Oceanics reduced total debt from $1.7 billion to $1.2 billion in 2016, including $201 million in bond purchases and $250 million in retained cash flow payments. The decline in debt not only improves the balance sheet profile but also helps the company reduce the debt servicing cost. It is also important to note Atwood has successfully negotiated debt covenants that give it much needed breathing space in terms of financial flexibility. It is very likely that industry sentiments will be significantly better by the end of 2018 and further relaxation of covenants will not be needed. From a balance sheet perspective, Atwood Oceanics has no debt maturity until May 2019. With no debt refinancing pressure and limited capital expenditure in the foreseeable future, the company's cash flow can be potentially deployed to further deleverage. I expect net debt to see sustained decline. Even when I was significantly bearish on Atwood Oceanics, I opined the company's fleet is among the best in the industry. With a high-specification fleet and an average age of only five and a half years, there is no doubt the company is well positioned to capitalize on market recovery. The company's young fleet is extremely capable of winning contracts as industry conditions improve. With some recent marketing success, Atwood Oceanics has demonstrated that winning contracts might not be a big challenge in improving industry conditions. I believe that near-term contracts are likely to be short term in nature however. Once there is more certainty on sustained industry recovery, the company's backlog will swell. The company has done a good job in terms of cost control. Its onshore support cash cost has declined by 31% from 2015 to 2017. At the same time, the rig operating cost witnessed 20% to 25% reduction during the same period. While the EBITDA margin is likely to remain muted on declines in day rates, the crisis has helped the company pursue tighter cost control, which is a long-term positive. I strongly believe oil has bottomed out. It would not be surprising if oil trends above $60 per barrel in the second half of 2017 and sustains at higher levels. In a recent OPEC and non-OPEC compliance meeting, it was clear that members intend to stay united and push oil prices higher. This is critical as several countries have seen their country's finances declining. With tensions escalating between the United States and Iran, there might be a renewed case for oil upside on the back of geopolitical factors. Further, President Trump is focused on U.S. manufacturing, which requires a relatively weaker dollar. I see a weak dollar as a positive for oil in the medium term. Considering these few key factors, I am bullish on oil and believe positive sentiments will sustain for the offshore drilling industry and benefit Atwood Oceanics. At a time when Seadrill Ltd. (SDRL) is undergoing some serious restructuring, it is heartening to see other offshore drillers taking well calculated steps towards ensuring they navigate the crisis with decent fundamentals. Atwood Oceanics is among these well positioned drillers. Atwood Oceanics is worth buying in small quantities and I would not be surprised if the stock delivers robust returns in the next 12 to 24 months. Disclosure: No positions in the stocks discussed.